We’ve fielded a few requests lately from representatives of fellow RPCV groups who want to know how we optimize our website and social media accounts to best engage our members and support our group’s activities. In the following three posts, I will outline our communications strategy-- not just its function, but the rationale behind it --and the safeguards designed to sustain it long into the future. By putting our plan in writing, I hope to provide a guide for others to follow as they forge their own groups and spur feedback from our members and stakeholders for future improvements. Please direct your thoughts, comments, and questions to publicrelations@rpcvw.org. The best way to doom a perfectly good communications plan is to misidentify your audience. Your audience is your boss. Your audience determines the success or failure of whatever initiatives you’re trying to promote. Forget who they are, and you can forget reaching them. Over the last few years, RPCV/W has made a concerted effort to define our audience. Thanks to the variety of accessible data analysis and outreach tools available online, it is now easier than ever to organize, measure, and mobilize to your followers. Our audience is a product of both environmental and operational factors. Washington, DC is a compact, regional hub that attracts many due to its history, its culture, and its institutions. These same qualities attract and retain RPCVs. The RPCV/W audience includes individuals and organizations, new arrivals and established Washingtonians. Balancing our message among these constituencies is key. As we learn more about our history, a model of our audience begins to emerge. RPCVs have been coming to DC since the Peace Corps was founded. Many were involved in the Peace Movement of the 1960s and there are several documented instances where RPCVs gathered to protest the war in southeast Asia. They found jobs in the civil and foreign service and set down roots. They started forming groups in the 1970’s, banding together for social solidarity and to support projects abroad. RPCV/W was formed in 1979 as an offshoot of the National Council of Returned Volunteers, which is now known as the National Peace Corps Association. RPCVs in DC banded together to do service projects, network, and commemorate special events such as Peace Corps anniversaries. RPCV/W was formally incorporated as a 501c3 nonprofit organization in 1991. As the years passed, a diverse, multi-generational community of RPCVs came into being, with new members arriving every week. New arrivals are the blood of RPCV/W. They drive our professional development and networking events. They come to Washington for jobs or education and recognize that establishing a strong support system is essential to survival. Some volunteer their time to help out, distinguishing themselves in the community and assuming leadership roles. They tend to be young, educated, and exceptionally driven individuals. On the downside, new arrivals require dedicated orientation and mentoring to thrive. By its very nature, DC is a town of protocol and peculiarity. Finding reliable housing is always a challenge and getting a job here can be astoundingly difficult. Your experiences abroad might not translate as effectively as you thought they would. You are surrounded by monuments to wealth and power. As anywhere, loneliness can be a factor. It’s easy to become discouraged or bitter, which essentially cripples your effectiveness in every pursuit. New members need to be engaged often and shown a pathway to advance in the community. Otherwise, they may lose interest and move on. Helping new arrivals establish themselves is a top priority for RPCV/W. Established members are the brains and muscle of RPCV/W, since they possess institutional knowledge and can be counted on to pay dues and attend events. All of them were new arrivals once, so they know the importance of maintaining a social and professional community. They shape the organization by electing the Board of Directors, and many pitch in at events or suggest activities for the group. Though they share a strong identity, established members are vulnerable to the same factors that affect new arrivals. The demands of work and/or family can put tight constraints on their schedules, and they may not be as receptive to certain events as they once were. The novelty of meeting new people can wear thin, and the formulaic, transactional nature of first-time interactions become to some a source of annoyance. Generational gaps threaten to alienate large sections of your membership, compounded by organizational shifts to technology which they may find unfamiliar. In addition to providing the vast majority of our funding through annual dues, members possess the power of the vote, and therefore ensure the accountability and legitimacy of the organization. Representing them in the best light, while staying true to their interests, adds value to their membership and magnifies their influence in the community. Outside stakeholders are the last major group of our audience and also the most difficult to pinpoint. RPCV/W is very active in the community, and our community is the ideological hub of Western Civilization. We are surrounded by giants: Government agencies, multinational non-profits, educational institutions, major corporations, and every identity-based group imaginable. Our members work for and with these entities, and they reach out to us for all sorts of reasons. From local charities looking for volunteers to come out on a Saturday morning to policy institutions seeking input on an initiative of national significance, our audience can include almost anyone. Working with outside stakeholders brings up a host of issues as you are now in charge of a brand and must craft a message that accurately reflects your organization. On one hand, we are a local organization run by a tight-knit band of volunteers who specialize in having fun and helping worthy partners. On the other, the relationships we build with outside stakeholders translate into new opportunities for our members and a heightened stature in the community-- public outreach being woven into our post-service identities and sanctioned through the Third Goal. The challenge, then, is to articulate an engaging narrative that stays true to the group’s roots while capturing the imagination of those who share our values. 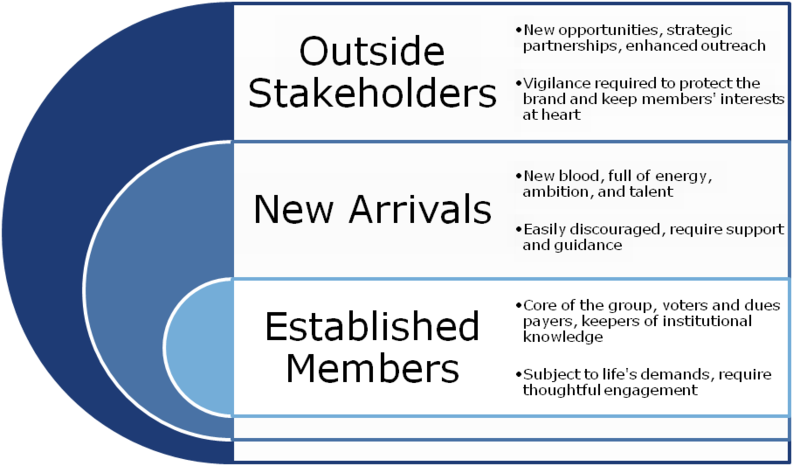 New arrivals, established members, and outside stakeholders: These are the most strategically-sensible populations to engage and therefore make up our primary audience. Their participation determines the vitality of the organization. When you organize an outreach campaign, it’s easy to get bogged down in the details and lose track of the people you are trying to reach. This model of our audience did not come about solely through observation. RPCV/W conducts yearly surveys. Our website requires members to register accounts, providing us with basic information, and Google Analytics tell us how and when people utilize it. The social media accounts we maintain have built in analysis tools that provide similar information. Taken together with face-to-face interactions during the dozens of events we hold per year, an active database makes it possible to truly know your audience. Since we now have an accurate picture of who we’re communicating with, we can proceed with a plan tailored to their needs. In my next post, I will outline the different components of our operation and describe how they work together to meet our goals.